A line chart displays a set of points connected by line segments. Line charts are commonly used to display changes over time. Below, is some simple code to create a line chart in R using the ggplot2 package. To do this, you’ll need to have R and ggplot2 installed. If you don’t have R set up and installed, enter your name and email in the sidebar on the right side of the page and we’ll send you a pdf to help you get set up. 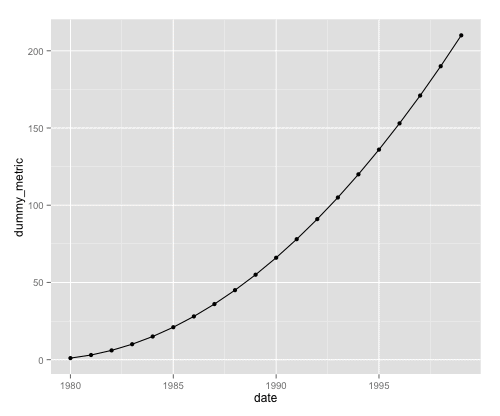 Here’s the code to create a simple line chart in R.
Here, we're calling the ggplot function. With the first argument, data=df.dummy_data, we're telling ggplot to plot data from the "df.dummy_data" data frame. The next piece, aes(x=date,y=dummy_metric), specifies the variables we want to map to the x and y axes. 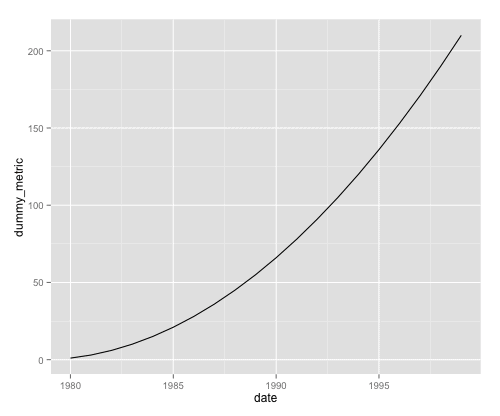 In this case, we're mapping "date" to the x axis, and "dummy_metric" to the y axis. To be clear, 'x=' and 'y=' are parameters and they enable us to map variables in our data frame to aesthetic elements on the plot. In this case, the aesthetic elements that we're mapping are the position on the x axis and the position on the y axis. If we wanted, we could plot other geoms instead of lines. And actually, we can plot them both at the same time. To illustrate this, we'll make a quick modification to the code by adding another line of code: geom_point(). In these two lines of code, we first plot line segments with geom_line() and then we plot points on top of the line segments using geom_point(). More technically, one would say that we added two layers. The line segments are one layer and the points are another layer. Keep in mind that we aren't restricted to just two layers. We can add more layers to generate more sophisticated plots. This is another property that makes the ggplot2 library extremely powerful, and we'll cover layering strategies in other blog posts. Do you have a question about this? Leave a comment below.